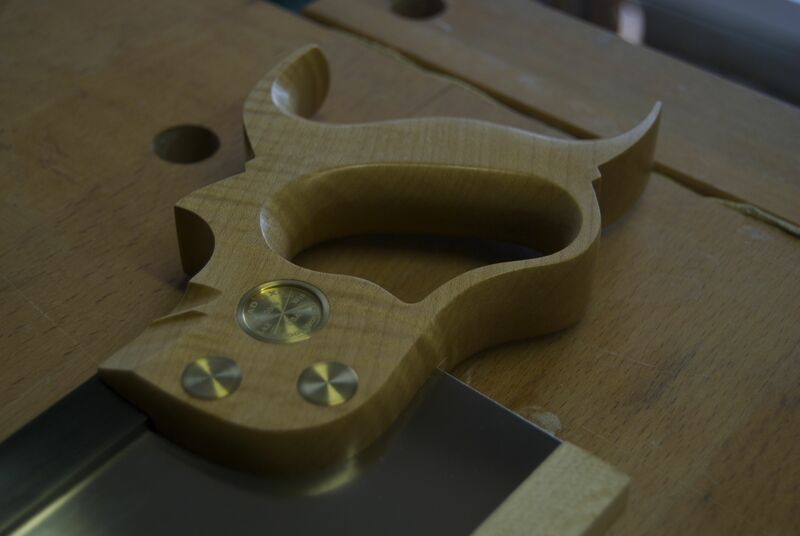 There is lot less sawing involved in lutherie compared to traditional joinery – I managed to build the Telecaster using only a bandsaw, a coping saw, and 10″ fret slot saw. That being said, cutting the slipper heel for acoustic guitar necks requires a good carcass saw, and given that this year’s major project will be the Anarchist’s Tool Chest, I thought it was time to grow my nest of saws. 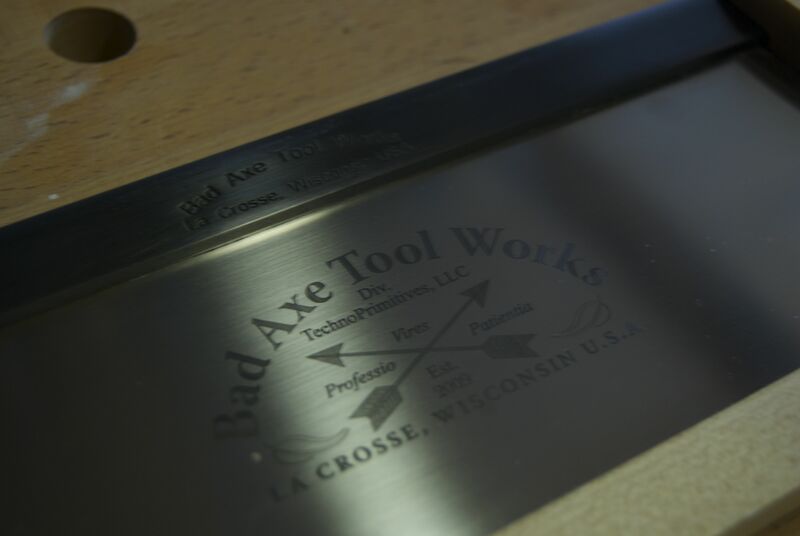 To this end, in December I put down a deposit on a 12″ carcass saw from Bad Axe Tools, which I followed with the deposit on a 10″ dovetail saw earlier this year. 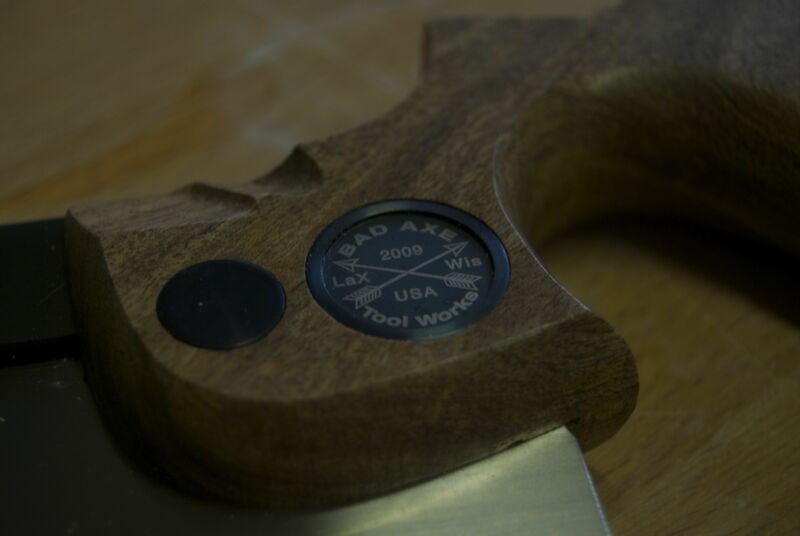 Mark Harrell at Bad Axe is incredibly helpful, and when I first placed the orders he asked me for details of what sort of projects I would be using the saws on, and particularly the types of wood and timber thicknesses I commonly work with so that the saws could be sharpened to best suit those projects. Mark also asked for precise measurements of my hand so that he could ensure that the saw totes fitted my hand perfectly, and to my knowledge he is the only major saw manufacturer who offers this service. Four months of waiting seemed like an age, although Mark kindly kept me informed throughout the build process so that I was never left wondering what was going on. 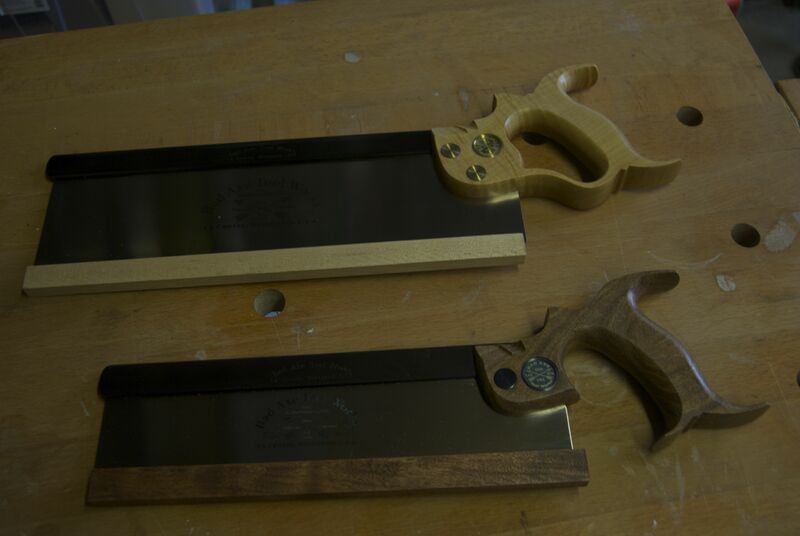 The saws arrived last weekend, and I have spent the past week putting them through their paces. The wait was most definitely worthwhile, and the saws have exceeded my expectations. The fit and finish on both tools is perfect – the saw plates are dead nuts straight, the nuts fit exactly with no gaps, and the totes are comfortable. The sizing options means that the totes fit my hand perfectly, and the finish is delightfully tactile. These are not just beautiful tools to look at though, they also perform as well as they look. I rummaged through my scraps box to find choice pieces of maple, swamp ash, mahogany, steamed pear, and pine. The saws took all of this in their stride, and even the hard maple was no problem. Mark’s reputation as a skilled saw sharpener are well deserved as these saws are razor sharp. I find that cheap saws can make starting the cut difficult, with a lot of chatter until the saw gets going. There is no such problem using either of my Bad Axe saws – both start cleanly on the first push and cut with precision.The carcass saw leaves a finished surface which requires practically no clean up, while the dovetail saw is aggressive in the cut yet wonderfully balanced and controlled. A good tool is one which does it’s job well with the minimum of fuss. A great tool is one which does all that, and also inspires the user to improve their skill set, to use the tools, and to create. 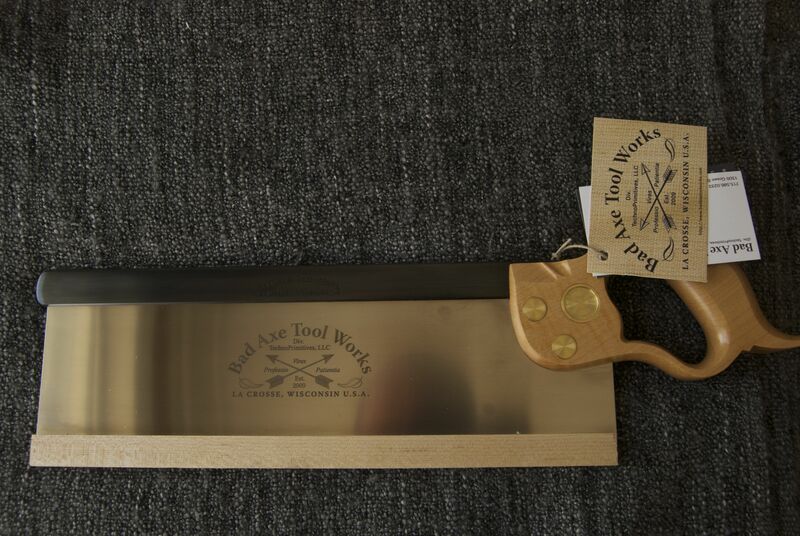 These are great saws, by any definition. And more than that, they are heirloom quality tools which I have no doubt my grandchildren will be using. 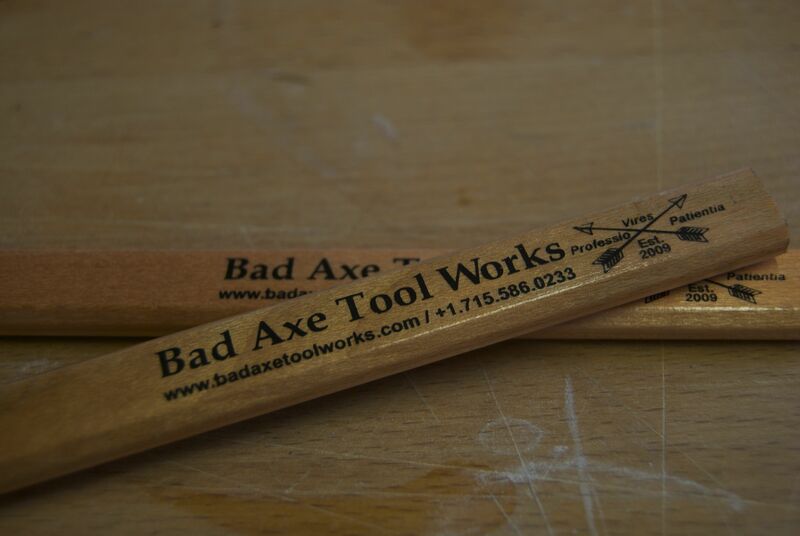 I cannot recommend Bad Axe Tools highly enough. I will definitely be adding a Bad Axe tenon saw to my tool chest later on this year. 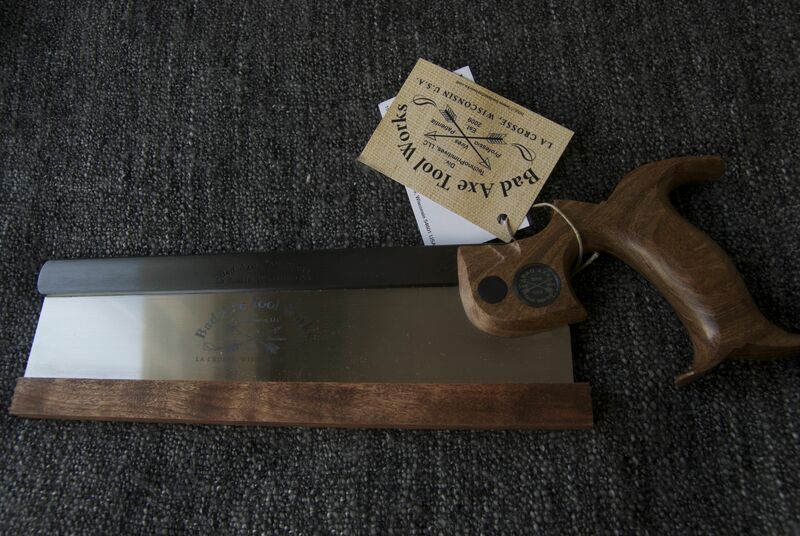 10″ ‘Doc Holliday’ dovetail saw. There’s mojo in a pair of saws. The dovetail saw, with gunsmith niter-blued saw nuts on mesquite tote. While the carcass saw has the classic combination of brass nuts and maple tote. The inclusion of branded carpenters pencils is a nice touch, as are the included tooth guards in timber to match the totes. Wonderful etching on the saw plate. This entry was posted in Furniture Making, Tools by overthewireless. Bookmark the permalink.